Aidan Wythe and Rae Cordell had one incredible night together–just before Aidan transferred Rae, his star VP, to Pittsburgh. 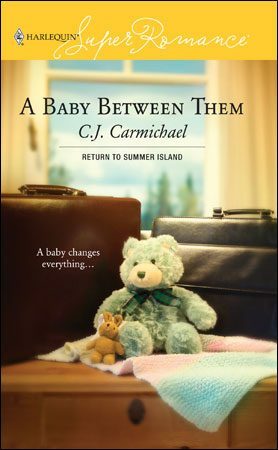 Now, more than eight months later, Aidan arrives on Summer Island to spend his vacation. But instead of the empty house he’s expecting, Aidan finds Rae. He’s even more shocked to see that she’s pregnant–with his child! Rae never planned on children. She’s decided on adoption for her baby, but Aidan’s reappearance in her life makes her question that decision. And Aidan? He has to question his feelings about everything now–the woman, the baby, his future. Whatever happens, things won’t be the same when he and Rae leave the island. 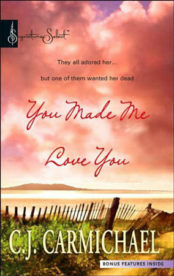 In this book I'm taking you back to Summer Island, a locale I first introduced this June, in the Signature Select Saga, You Made Me Love You. I first dreamed of this series after an idyllic family holiday visiting my sister's family on Saltspring Island. We had a grand time lazing on the ocean shore, hiking in the rolling hills and kayaking on the becalmed sea. One of the highlights for my city-slicker daughters was setting traps for crabs with my brother-in-law Gord. I couldn't believe it when those picky little children actually ate them, too! As we explored the Gulf Coast island, I knew I had to write a book about this place one day. No, not just a book, a three-book series. I wasn't sure what the stories would be about, but I started with a picture in my head...Five friends sitting around a bonfire on the beach late at night. They're roasting marshmallows and drinking and kidding around with the ease of kids who've known each other all their lives. Then someone new asks to join their group...and their futures are altered forever. “You didn’t know?” Rae’s voice, usually so strong and confident, gave out in a squeak at the end of her question. Aidan couldn’t find the words to answer her. He was in shock. Her belly was huge. Enormous. She looked like she was ready to pop at any second. He tore his gaze from her middle and gave the rest of her a closer look. In contrast with her belly, her arms and legs seemed abnormally skinny. Once she’d had curves in all the right places. Now her curves were definitely in all the wrong places. He covered his face with one hand. Groaned. Eight months...yes, that took them right back to the night he’d been with her. He’d known then he was making a mistake. But he’d had no idea just what a whopper it would turn out to be. Since he’d married Justine, Harrison had started working eleven months of the year from here on Summer Island. It had fallen on Aidan—who’d been promoted and given a huge raise—to fill in the gaps. Aidan paced to the far corner of the room. He needed space to think about this. He needed to be calm and rational. But every time he looked at Rae’s enormous belly he felt like he was going to have a panic attack. Focus on something else for a minute. In front of him, the Kincaid china cabinet was filled with French Provincial serving dishes, tea pots, ornaments. He felt like smashing all of them. So much for calm and rational. She blinked and her head jerked back a little, as if he’d slapped her. What had he said wrong this time? Surely she couldn’t deny that what they’d done had been ill advised, to say the very least. “Look, we’re two ambitious people, who in a moment of weakness...” He paused, remembering that moment of weakness, and how truly incredible it had seemed at the time. That night he’d wanted her so badly, he hadn’t cared about consequences. About any consequences. For the first time in his life he’d been so carried away, he hadn’t used a condom. He hadn’t even asked if she was protected. Which, clearly, she hadn’t been. “Rae, even if you think I’m the biggest jerk in the world—"
“A chance to do what, Aidan? Marry me?” She took off the oven mitts. Tossed them to the counter, like she was issuing some kind of challenge. “Is that what you want?” he asked quietly. Okay, that hurt. But why? Wasn’t this exactly the reason he’d sent her away? So their feelings for one another would cool to the point that they’d be able to continue their professional relationship without risk of messy emotional entanglements? “As the father I have responsibilities. At the very minimum, there will be support payments.” He pictured years and years of tidy monthly bills, and the thought of this obligation, which he was certainly capable of following through on, calmed him somewhat. Rae crossed to the closest of the windows and opened it, allowing a fresh breeze into the house. Leaning her forehead against the frame, she fixed her attention on the sea. For a moment, Aidan admired the beauty of the woman. Rae had strong, compelling features, with thick dark hair, rosy cheeks and a lush wide mouth. Since the first day he’d met her, he’d been attracted to her. Then she’d been lean and fit with small, high breasts and a curvy bottom he couldn’t tear his gaze from. Now he was surprised to realize that her new shape held a certain fascination for him, too. He was so focused on the picture she made, outlined against the bright sunlight from outside, that he almost missed her next words. That last bit startled him, as much as it obviously surprised Rae. She turned to him, her dark eyes narrowing skeptically. When had he decided he wanted to be a father in a real sense? Aidan didn’t know. But it was true. He wasn’t going to walk away from this responsibility, no matter how much he didn’t want it. This should have filled him relief. Instead, Aidan was furious. With her—and with himself. He clenched his fists, and wondered what kind of man felt like shaking a pregnant woman? But that was his urge right now, exactly. He wanted to grab her by the shoulders and make her look at him. He jammed his hands into his pockets, again.